The Congressional Budget Office (CBO) has estimated that gasoline prices will increase by 13 cents to 26 cents per gallon by 2017 if the Renewable Fuels Standard remains unchanged, according to the Daily Signal. The Renewable Fuels Standard (RFS) encourages increased production of various forms of ethanol and biodiesel, and it mandates that fuel contain a certain amount of renewable fuel. But despite the fact that consumers do not want these fuels (and that advanced biofuels have failed to meet production and use targets), the oil industry is forced to produce them. - RFS advocates promised that production of cellulosic ethanol (made from non-edible plant material) would be able to match projected use, but they were radically wrong. Cellulosic ethanol has been largely unsuccessful. - While corn producers have been able to produce plenty of corn-ethanol, the low energy content in each gallon makes the fuel unattractive. - Refiners cannot legally add any more ethanol to E10 gasoline (10 percent ethanol, 90 percent gasoline), as it can only contain up to 10 percent ethanol. - Refiners are having a difficult time getting consumers to buy their 85 percent ethanol blend (E85 -- 85 percent ethanol, 15 percent gasoline) without selling it below production costs. In order to meet RFS consumption targets, the CBO estimates that refiners would have to lower the price of E85 by as much as $1.27 per gallon to encourage sales. To do this, they would have to raise the price of their lower-ethanol content gasoline. Almost 40 percent of American corn goes towards ethanol, not food, production. Hence, the RFS drives up commodity prices, food prices and the cost of both gasoline -- providing little environmental benefit along the way. Many today believe that renewable energy will allow us to get off fossil fuels soon. Unfortunately, the facts say otherwise. Solar and wind energy account for a trivial proportion of current renewables, which is about one-third of one percentage point. The vast majority comes from biomass, or wood and plant material, which is humanity's oldest energy source. While biomass is renewable, it is often neither good nor sustainable, says Bjørn Lomborg, the founder and director the Copenhagen Consensus Center. The indoor air pollution that biomass produces kills more than 3 million people annually. According to International Energy Agency (IEA) data, 13.12 percent of the world's energy came from renewables in 1971, the first year that the IEA reported global statistics. In 2011, renewables' share was actually lower, at 12.99 percent. Yet a new survey shows that Americans believe that the share of renewables in 2035 will be 30.2 percent. In reality, it will likely be 14.5 percent. The reality is that humanity has spent recent centuries getting away from renewables. 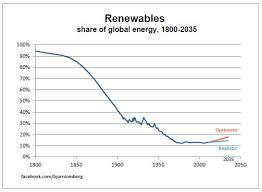 In 1800, the world obtained 94 percent of its energy from renewable sources. That figure has been declining ever since. To be sure, wind and solar have increased dramatically. Since 1990, wind-generated power has grown 26 percent per year and solar a phenomenal 48 percent. But the growth has been from almost nothing to slightly more than almost nothing. In 1990, wind produced 0.0038 percent of the world's energy; it is now producing 0.29 percent. Solar-electric power has gone from essentially zero to 0.04 percent.